Dr. Viktor E. Frankl, the renowned developer of Logotherapy and holocaust survivor described several examples of resiliency in his book. Frankl mentioned how being in Auschwitz and other concentration camps could rob a man of his values due to the devaluation of human life. He said, “If the man in the concentration camp did not struggle against this in a last effort to save his self-respect, he lost the feeling of being an individual, a being with a mind, with inner freedom and personal value” (p. 60) though everything in the camp fought to steal that from him. He indicated that despite the difficulties in the camps, man still has the “choice of action...can preserve a vestige of spiritual freedom, of independence of mind...” (P. 74). He recalls the men that would walk through the camps giving comfort to other prisoners (no small task), giving their last piece of bread, and exercising their last freedom, “to choose one’s attitude in any given set of circumstances, to choose one’s own way” (p. 75). He said that choices are made every hour of every day. They may be small, but they helped to maintain that final freedom. He emphasized that a prisoner could decide what kind of person he was and that it was not determined by the camp or situation. He indicated that there was meaning in suffering–that life had afforded him and others suffering to endure and to learn from–to develop character, purpose and to realize values. Thus, through suffering and even death life could not be complete as it is necessary. Suffering brought the chance of achievement (p. 76-77). To endure, a prisoner had to look beyond the current suffering to a better future, and to exercise faith in that future. Those who gave up hope and faith stopped living and died (p. 83). In order to survive, a man had to be shown a possible future. 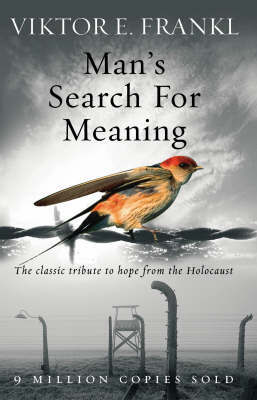 Frankl frequently remembered Nietzche’s words, “He who has a why to live for can bear with almost any how...” (p. 84). In focusing on those words he eventually came to understand a meaning to him in life. What was really needed was a fundamental change in our attitude toward life. We had to learn ourselves and furthermore, we had to teach the despairing men, that it did not really matter what we expected from life, but rather what life expected from us. We needed to stop asking about the meaning of life, and instead to think of ourselves as those who were being questioned by life–daily and hourly...Life ultimately means taking the responsibility to find the right answer to its problems and to fulfill the tasks which it constantly sets for each individual (p. 85). When in the depths of depression, what kept me going was ONLY the "why's and "for what purpose?" my life's value was. It always came back to my value as a wife, mom and now grandma. That always kept me going. Victor Frankl's book is amazing.